Congrats to Carmina & Zoren! Welcome to married bliss, Carmina and Zoren! Surprise, surprise! Re: Congrats to Carmina & Zoren! Legaspi enlisted the help of his children with Villaroel, Cassie and Maverick, as well colleagues of the actress-host from ABS-CBN, to carry out the surprise proposal and wedding ceremony held Thursday evening at Fernbrook Garden in Alabang, Muntinlupa City. The wedding was attended by showbiz colleagues of the couple and their non-showbiz friends and family. Villaroel and Legaspi have known each other since his "That's Entertainment" days, when the actor-host openly expressed his admiration for the Kapamilya actress. She was 13 years old then. Before they became a couple, however, the two were romantically linked to other showbiz personalities. Legaspi was in a relationship with Ruffa Gutierrez for a time, while Villaroel was married to actor Rustom Padilla in 1998. The actress-host's marriage with Padilla was short-lived, however. In 2000, Villaroel separated from the former hunk actor, who later admitted on national television his sexual preference, and re-emerged as a "woman" named BB Gandanghari. Following this, Villaroel and Legaspi, who had been long-time neighbors in Pasig, became closer as friends and eventually became a couple. In 2001, the actress gave birth to their children, Cassie and Maverick, in the United States. After 12 years of being a couple, the chance of marriage had eluded the couple due to "legalities" and "annotations" from Villaroel's previous marriage with Padilla, until August this year. At the time, on the ocassion of the actress-host's 37th birthday, Legaspi openly expressed his intentions to finally marry Villaroel before the end of the year. MANILA, Philippines -- Twins Cassie and Maverick don't mind if their father, Zoren Legaspi, wasn't the first husband of their mother, actress Carmina Villaroel. On "KrisTV" on Monday, Legaspi said he was caught by surprise when his twins told him that they already knew that Rustom Padilla, now known as BB Gandanghari, is their mom's first husband. "Nalaman nila 'yung kabuuan ng plano (ng kasal) a week before. Pero bago ko sinabi 'yun (kasal) sa kanila mayroon akong sinabi sa kanila -- 'yung history ng buhay ng mama nila. I have to say it, I have to tell them 'yung love story ni Mina dati," Legaspi told host Kris Aquino. "Pero ito sabi ko kailangan kong sabihin para maintindihan nila kung bakit kami ikakasal. Kasi ang alam nila kasal kami ni Mina. So kinausap ko sila, sabi ko, 'Kids, dapat kaming dalawa ng mommy niyo ang magsasabi nito but I have to say it now dahil hindi ba...' I was preparing na parang Coco Martin ang drama and you know iyakan. Sabi ko, 'I'm not the first husband of your mommy.' Sab noong dalawa, 'Yeah, we know.' 'What? What do you mean we know? Eh, sino ang first husband ng mommy niyo?' 'That dude, that BB.' Sabi ko, 'What? You know?' Sabi ko, 'Who told you this?' 'We watched 'The Buzz,'" Legaspi recalled. The actor said even when he had a one-on-one interview with Gandanghari, he and Villaroel never told their children about him. "I felt very good not because inamin ko sa kanila but because of how they handled it. Sabi ko, 'Wow walang insecurities itong dalawang ito.' For them, it's just water under the bridge," Legaspi said. The celebrity couple said they were really planning to tell the truth to their kids but they were just waiting for the right time. Villaroel admitted that for years their children believed that she and Legaspi were already married -- which they never denied nor confirmed. "Kasi ang bata in-assume nila na kapag magkasama kayo sa bahay at may mommy at daddy eh -- kasal. So they just assumed and hindi ko muna kinorek 'yon for a time, kumbaga hindi ko [itinanggi] hindi ko [kinumpirma]. Kasi alam ko darating ang time na ito na sasabihin ko din sa kanila," the actress said. 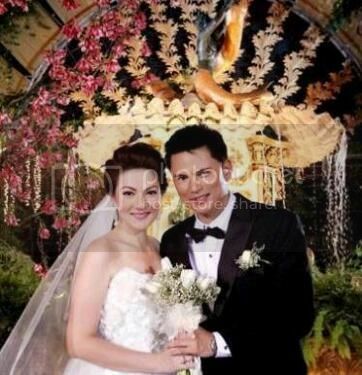 Last Thursday, Villaroel and Legaspi were married after the actor-host proposed to his partner of 12 years. Legaspi asked the help of his children, as well colleagues of the actress-host from ABS-CBN, to carry out the surprise proposal and wedding ceremony at Fernbrook Garden in Alabang, Muntinlupa City. father to marry his daughter. In an interview with Boy Abunda after the surprise wedding that happened at Fernbrook Garden in Alabang, Muntinlupa City last Thursday, Legaspi said Villaroel’s father was in critical condition months back and he told him that he will marry his daughter once he gets better. “Wala ka kasi doon sa family meeting nung inoperahan ang daddy mo. Hindi ka nila in-inform, hindi kita in-inform na ang kalagayan ng daddy mo noon, 50-50 talaga. So the next night, pumunta ulit ako kay Daddy Reggie tapos parang binigyan ko siya ng something to look forward to. Sabi ko, ‘Daddy Reggie, hindi ko po nasabi sa inyo na ikakasal kami ni Carmina ngayong November so magpagaling kayo agad,’” he shared. Legaspi said he really intended to propose to Villaroel when their family went to Japan for a vacation recently, but his plan did not push through. The actor then thought of proposing to Villaroel again after the actress had a press conference for her show “Lorenzo’s Time” where she revealed that she will be married soon. “Sabi ko this is the right opportunity dahil nandito ang family mo from San Francisco. Pinili ko talaga yung birthday ng daddy mo which is November 16 para 'yung day namin pareho,” he said. While they both waited for 12 years to be married, Villaroel said it was all worth it because she does not see herself spending the rest of her life with someone else. “Yung relationship naman natin close to perfection. We don’t fight, bickering, yes, pero para tayong sitcom. Nilu-look forward ko ang buhay ko na ganoon pa hanggang maging lolo at lola tayo,” she said. Villaroel and Legaspi have known each other since his "That's Entertainment" days, when the actor-host openly expressed his admiration for the Kapamilya actress, who was 13 years old then. However, it was only in year 2000 when they became closer as friends and eventually became a couple. After 12 years of being a couple, the chance of marriage had eluded the couple due to "legalities" and "annotations" from Villaroel's previous marriage with actor Rustom Padilla, until August this year. Actress-TV host Carmina Villaroel was surprised by his partner of 12 years, Zoren Legaspi with a grand proposal and solemn civil wedding held last Thursday (November 15) at Fernbrook Garden in Alabang, Muntinlupa City. Teary-eyed Carmina was shocked and blissful at the same time when she suddenly walked down the aisle in a wedding she never had any idea of. All she knew that she was there to for a photoshoot of a commercial. The big surprise which was organized for almost two months by Zoren, with the help of their families, their twins Mavy and Cassy, and ABS-CBN. “Finally, this is it! It’s not actually needed but Zoren made it happen. I’m really super happy,” said Carmina during his exclusive interview with “Showbiz Inside Report” which will be shown this Saturday (November 17) on ABS-CBN. Among those who were invited in the suprise wedding were Carmina and Zoren’s family member and close friends in and out of showbiz. Grace Poe Llamanzares, Eric Quizon, and Kris Aquino were among their godparents. Don’t miss the exclusive coverage of the surprise proposal and wedding of Carmina and Zoren in the country’s top-rating and trending showbiz-oriented talkshow, “Showbiz Inside Report,” this Saturday, 2:30pm, after “It’s Showtime,” on ABS-CBN. For more updates, log-on at www.abs-cbn.com, follow @SIRTVOfficial on Twitter, or like the Facebook fanpagehttp://www.facebook.com/ShowbizInsideReport.AbsCbn. Zoren-Carmina: Always Forever, A Wedding Like No Other" will be aired on ABS-CBN on November 24 after "Maalaala Mo Kaya." Thank you to ABS-CBN special projects team. I love you all. Thank you for making me the happiest girl alive! I'm speechless again. Maraming salamat sa lahat ng kinilig, na in love, Umiyak at naki tawa. Nakaka taba ng Puso. Sa lahat po ng nanood ng wedding special namin kagabi, maraming salamat po from the bottom of my heart. Zoren-Carmina wedding...beautiful breakthrough ! soo much love overflowing! Love it! May meeting ang mga kalalakihan kung paano itutumba si zoren dahil OA na ang demands ng mga brides! Gusto may tito boy din sa wedding nila! Wow!!! Thank you all for watching our wedding special. Trending pa?! Super thank you everyone. Mwah! What a perfect wedding and what a beautiful couple. OT: Cassy and Mavy should be artistas. Cassy looks like a younger Mina and Mavy looks like a younger Aga Muhlach. oh My ! Bakit parehas tayo ng iniisip , at look alike talaga ni Aga noh?...... di kaya totoo yung natsismis dati about dun sa kambal ? I'll no comment about that one.